The Jelly Autographs transferred from original 78s for the first time since the 1960s, with sound restoration by Hans Eckhoff. 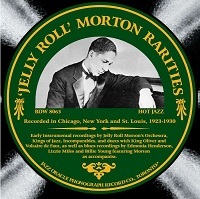 Also includes all of Jelly’s pre-Victor instrumental recordings for Paramount and Gennett, as well as blues recordings by Edmonia Henderson, Lizzie Miles and Billie Young, featuring Morton as accompanist. Includes duets with King Oliver and Voltaire de Faut. Detailed liner notes are by Reide Kaiser, a noted Toronto pianist and Morton expert.